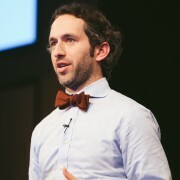 David Rothschild is an economist at Microsoft Research. He has a Ph.D. in applied economics from the Wharton School of Business at the University of Pennsylvania. His primary body of work is on forecasting, and understanding public interest and sentiment. Related work examines how the public absorbs information. He has written extensively, in both the academic and popular press, on polling, prediction markets, social media and online data, and predictions of upcoming events; most of his popular work has focused on predicting elections and an economist take on public policy. After joining Microsoft in 2012 he has been building prediction and sentiment models, and organizing novel/experimental polling and prediction games; this work has been utilized by Bing, Cortana, and Xbox. And, he correctly predicted 50 of 51 Electoral College outcomes in February of 2012, average of 20 of 24 Oscars from 2013-6, and 15 of 15 knockout games in the 2014 World Cup. You can find David's full biography at ResearchDMR.com.